Tuesday - June 4, 2019, 6:30 to 9:00 p.m.
Saturday - June 8, 2019, 9:00 a.m. to 3:00 p.m. Become immersed in the world of Leonardo da Vinci in this two-part experience. First, Dr. Steve Nash, curator of archaeology, will share insights on the life and times of Leonardo, followed by after-hours access to the temporary exhibition Leonardo da Vinci: 500 Years of Genius. Part two is an experiential learning workshop at Anatomy in Clay Centers. Instructor Jon Zahourek—anatomist, artist, scientist, and inventor—will guide you through Vitruvius’s rules of proportion for humans and architecture. Based on the notes of architect Vitruvius Pollio (80 BCE), Leonardo’s drawing The Vitruvian Man became known as the “Canon of Proportions.” Vitruvius’s universal design principles embody his belief that the workings of the human body are the same as the workings of the universe. 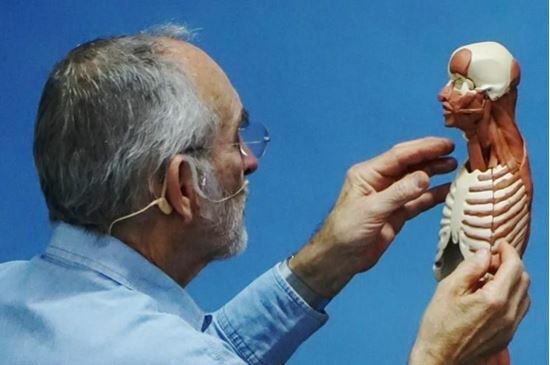 In the studio, you will have an opportunity to put your genius to work as you form anatomy in clay onto Zahourek’s MANIKEN® models of the human skeleton. Materials included.